There are five Tea Party PACs that are out there swindling hapless and ignorant voters and donors out of their money, reported The Daily Beast. There are five Tea Party PACs that are taking their donations, and reallocating the money in other expenses. For instance, the Tea Party Express raised over $9.5 million from January 1, 2013 to June 30, 2014 but less than $400,000 went to the candidates. According to Practical Politicking, the group also went upside down on their funding, decreasing their cash-on-hand by $350,000. Of that $9.5 million, over $3 million went to the PAC founder’s consulting firm. The operation is little more than a sophisticated in/out box for $100 bills and big checks. Tea Party Express spent well over $6 million on fundraising efforts in order to perpetuate a neverending cycle of political donations; get millions and spend millions on getting more millions. 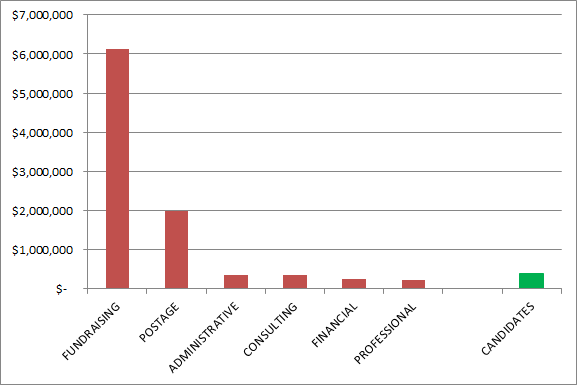 The residual funds are spent on postage, administrative, and professional expenses. The article explains it best by describing the operations as “ideological Ponzi schemes,” where “slick, fast-talking” fundraising people talk up potential donors into giving their money, unaware that only pennies to the dollar actually go to any ludicrous cause they’re getting behind. Although we don’t really care how much money Tea Party candidates have or don’t have, scamming the wallets of any one is absolutely wrong.